Scene of the Blog Featuring Shelleyrae of Book'd Out! I have a feeling that Shelleyrae found me before I found her. Doesn't really matter, because not only did I gain an insightful reader of Kittling: Books, I also found an excellent blog to read. The second I visited Shelleyrae's blog Book'd Out and saw the header photo, I fell in love: a suitcase filled with books that's washed up on a beach. That photo spoke to the part of me that packs books for long journeys well before I think of what clothes to take along! There's a lot more to Book'd Out than the header photo, of course, or I wouldn't keep coming back. 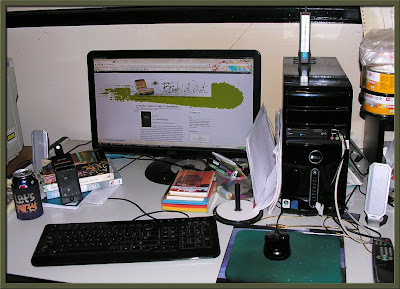 Shelleyrae reads an eclectic mix of books, and two of my favorite features are the Australian Women Writers posts, and her Stuff on Sundays series. If you haven't visited Shelleyrae's blog before, I certainly hope you take the time to do so, and please remember to say hello while you're there! If you're visiting from Book'd Out-- Welcome! Thanks for stopping by. If you'd like to see any of Shelleyrae's photos in larger sizes, all you have to do is click on them, and they'll open in a new window. If you'd like to see the creative spaces of other book bloggers, please click on the Scene of the Blog tab at the very top of my header. Shelleyrae's waiting to give us a tour, so let's not keep her waiting! Hi! My name is Shelleyrae and my blog, Book'd Out is just over a year old. I read a lot, read fast and enjoy a reasonably eclectic selection of genres. 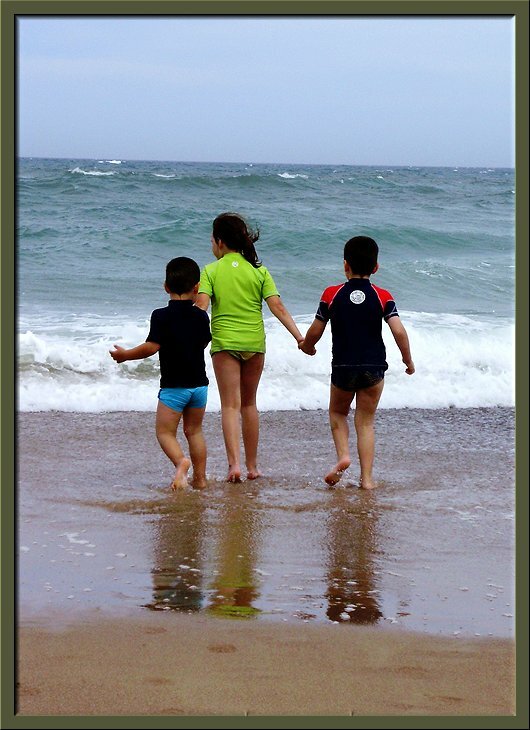 I am a thirty something married mother of four (aged 5 - 15) living in a country coastal town in northern New South Wales, Australia. I work part time, hope to study for a second degree next year and don't sleep much! I was excited to receive the invitation from Cathy to participate in Scene of the Blog (thank you! ), and then I looked around the room and groaned. I work primarily on my desktop, though I also have a laptop, in the once 'guest' room that is now a catch all for out grown toys and clothes from my four children, empty appliance boxes my husband refuses to throw out, piles of paperwork and the paraphernalia associated with my past and current work and hobbies. A child gate in the doorway hasn't been removed even though this year all my children are finally at school. There is a television I half watch as I work at the computer but really the sound just keeps me company. There isn't a lot of light since the room is at the front of the house the glass is opaque and because the blind is broken I can't open it (I've been meaning to replace it!). In short it's a bit of a mess! None of the spaces in my house are pretty - functional would be the best description. I dream of clean, decorated and organised spaces and more bookshelves but that won't be happening any time soon. Maybe when the children leave home in about fifteen years! My computer desk is almost two meters long - bought more than ten years ago secondhand and is crowded with computer accessories, piled with notebooks, paper and of course books. The photo shows the space where I actually sit - editing out the clutter at one end, and I admit I tidied up the bit you can see. There is always a can of cola (usually Pepsi Max) nearby, whatever books are on my TBR list for the week along with my iPod Touch that I use as my e-reader, pens, a notebook etc. Ugh I didn't realise how filthy my mousepad is til I took this photo - time to replace that! Some of Shelleyrae's books. Click to view-- you'll be able to read the spines! The wall behind me hosts my main book shelf - it is about two meters high by three meters wide and sagging under the weight of books and magazines. What you can't see in this picture is that the bottom shelves are filled with resource books, text books, photography and scrapbooking magazines and picture books that have overflowed from my children's shelves. There are five boxes full of books that I plan to discard pushed against the base. The other four shelves are crammed at least two if not three deep with books I have read and want to keep or plan to read. The photo is a digitally stitched panorama of two shelves that took five individual photo's to construct. There are also books piled in other places throughout the house, mainly by my bedside or on the coffee table. I mostly read leaning over my kitchen counter or curled up on the chaise end of the couch in my lounge room, usually with at least one child draped over the top of me. During the summer I take the kids to the park by the river at the bottom of our street, or to the beach, just a few minutes away and read while they play. First off, I want to thank you for taking the time to stitch all those photos together. I know I'm not the only one who loves to read the spines of books, and by doing that, you've made a lot of people happy! I sympathize with your feeling that the rooms in your house are "functional but not pretty," but to me, rooms have to be functional or they're not pretty, so you're halfway there! I'd also say that I'm envious of your being able to read at the beach, but if I'm honest with myself... the few times I've been at a beach and had a book, I don't think I settled down to read even one paragraph! Thank you so much for allowing us this glimpse into your home, Shelleyrae. We certainly appreciate it! Thank you for inviting me to be part of this fun feature Cathy! I'm so glad to meet another blogger through Cathy's weekly event. Wow, Shelleyrae, you are a busy woman. I laughed when you said you read draped over your kitchen counter. And, like others above, I am a snooper of other people's books. Love the book shot and thanks for piecing it together. Now off to take a look at your blog! Awesome post! I love reading about bloggers and seeing what their spaces look like. Thanks, Shelleyrae and Kittling Books. Great post! I love reading Shellyrae's blog and am building a friendship of sorts with her. I hoped on over from Book'd Out - great post. I absolutely love this feature!! Book'd Out is a blog I try to visit often!! A great choice for Scene of the Blog!!! G'day Shelleyrae, from another coastal NSW book blogger! Crimepieces-- Thanks for stopping by because now I have a new crime fiction blog to read! Bernadette-- I'm the same way and for the same reasons! Mari-- Thanks for stopping by! CiT-- And I'm going to have to visit your blog! Lori-- Good to see you! Susan-- G'day! It's a long time since you've been featured! Nikki-ann-- I'm glad you enjoyed it. I followed over from Book'd Out and Shelleyrae hate to tell you this but all of us who love books have "functional spaces" even without the clutter caused by children. Love to read as much as you however not sure have ever thought much about what it would be like if had to compete with time for my books versus time for my family, I applaud you that you have somehow found that middle ground! Agreed with Jackie B about entire homes becoming functional spaces where books are involved! I've been trying to do a clean-out since I'm hoping to move overseas, but it's very hard to let go of those beautiful books! @Bernadette - I confess I don't sleep a lot LOL - and sure you can borrow it! @ Lori I am a regular visitor of your blog too! HOw I love your comment about choosing what books to take with you before you pack clothes for a trip!! That cracked me up. I felt that you were reading my mind. I think I pack 5 books for every one outfit! 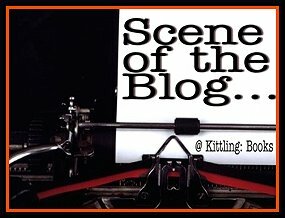 I do so love Scene of the Crime ( I mean Blog! );) What a fun glimpse again into bloggin-buddies. Thanks for all of your work putting this together for us!! Terrific work! Speaking of clear-outs, I now have 2,000 books. I used to have 6,000! Thanks for coming over to visit Jayne. I did box some up - i have 5 boxes worth but they have been there for 6 months and I still can't part with them!